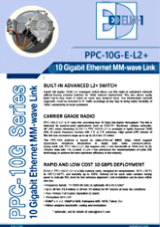 PPC-10G radio delivers true full duplex 10Gbps throughput for vertical markets as 5G/4G, enterprise connectivity, Safe City and other high capacity networks. Wide choice of modification of the radio are available, including 20 Gbps 2+0, high-power transmitter and built-in L2+ switch, with possibility of combining these features in one radio by customer order. 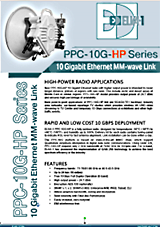 PPC-10G is IP radio link which intended for point-to-point applications with fiber-like reliability. 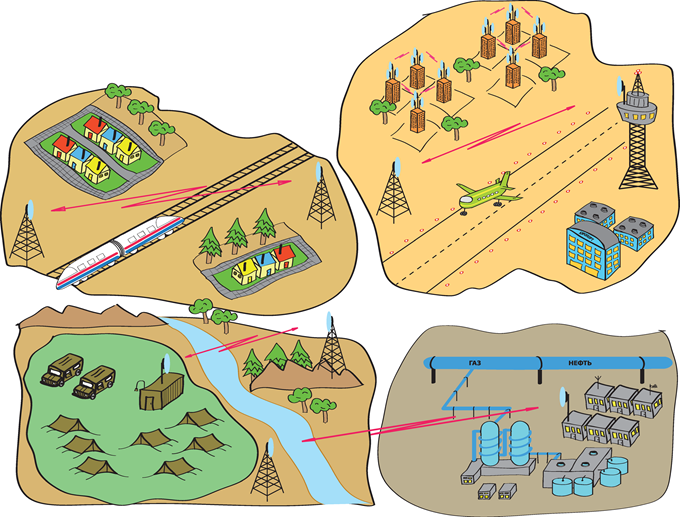 This millimeter wave radio operates in lightly licensed 71-76/81-86 GHz (E-band) spectrum which is governed by low fees and quick processing of licensing application. 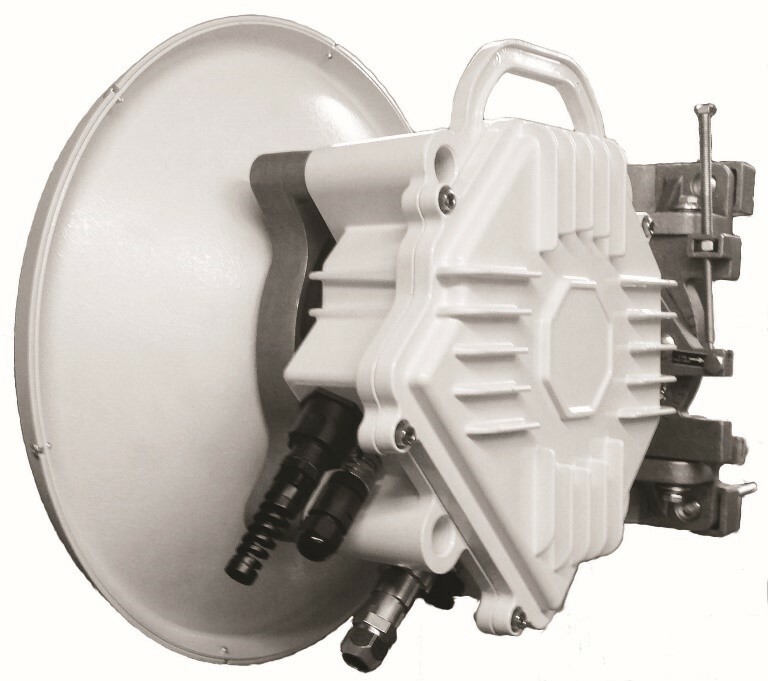 PPC-10G is also available in licensed 40.5-43.5 GHz (Q-band) frequency format. Radios in both E-band and Q-band are shipped with 1 ft. or 2 ft. antennas. The PPC-10G platform is based on state-of-the-art MMIC chips, which support Quadrature Amplitude Modulation in digital data radio communications. Using QAM 128, PPC-10G requires only 2 GHz bandwidth at 70/80 GHz for 10Gpbs rate. For Q-band, ELVA-1 has pioneered the implementation of QAM 256 technology to achieve the best spectrum efficiency in the industry. When the link`s SNR (Signal to Noise Ratio) is high (during good weather conditions), operation at full capacity is enabled, reaching the maximum speed of 10Gbps. In case that the link`s SNR drops significantly (during heavy rain), the channel throughput will be reduced. ELVA-1 delivers modifications of PPC-10G radio to satisfy customers according to their business needs. For 70/80GHz E-band radio, all advanced features of built-in L2+ switch, high-power Tx and 2+0 could be combined in one link. For 40.5-43.5GHz Q-band radio basic version PPC-10G 7.2 Gbps currently is available, modifications are at product roadmap. 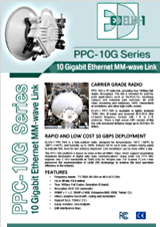 For example, PPC-10G link with 2ft antennas, 71-76/81-86 GHz band has code PPC-10G-E-2ft. To have L2+ switch option please add “L2” to code. Notes: For HP (High Power) radio, its central frequency is factory preset (not tunable by user), please advise its value at order. An FCC ID is the product ID assigned by the FCC to identify wireless products in the market. The FCC chooses 3 or 5 character "Grantee" codes to identify the business that created the product. In this case, ELVA-1 grantee code for FCC ID: 2AIXT-PPC-10G-E is 2AIXT. The remaining characters of the FCC ID, -PPC-10G-E, are associated with the product model. These letters are chosen by the applicant. ELVA-1 PPC-10G 70/80 GHz 10 Gbps MMW Link has been examined for compliance to 2014/53/EU Radio Equipment Directive (RED) at Washington Laboratories, Ltd. The RED's predecessor directive, the R+TTE Directive 1999/5/EC, was introduced in 1999 and now is absolete. This has led to a conformity assessment regime based on manufacturers' declarations. 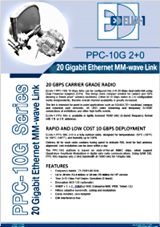 For more PPC-10G specifications, please download datasheets.